Click on any of the following images for a larger view. (Please note: some screenshots may not be completely up-to-date for this release of GoQat). 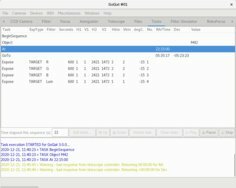 GoQat's main window showing the CCD camera tab when connected to a camera (QSI and SX only, in this release). Real-time camera status information is displayed at top right and messages from GoQat are shown in the message log at the bottom of the window. The QSI CCD camera configuration window, where camera cooling and other low-level options may be set, as well as specifying the filters in each filter wheel. Configurations are saved on a per-camera basis; you can specify different options for different cameras. GoQat's INDI client, showing control of a Starlight Xpress Lodestar camera. 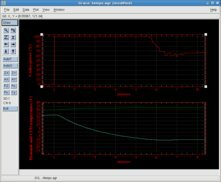 If you install Grace you can plot real-time scrolling strip-charts of the CCD camera cooler power in the upper plot (QSI only), and chip temperature (QSI and SX) and air temperature at the heatsink (QSI only) in the lower plot. You can customise the Grace plots to alter the size, background colour, plot colours and more. 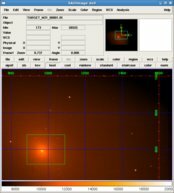 GoQat uses SAOImage DS9 for image display, offering a wealth of image analysis tools, including direct access to the image data from IRAF. A close-up of the core of M31 with grid overlay is displayed here using the 'heat' colour map, with a subframe area selected in green. GoQat can automatically generate a V-curve to calibrate the autofocus for your optical system. 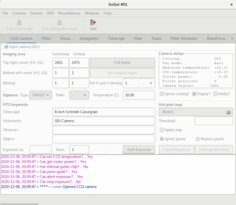 GoQat's autoguider window. 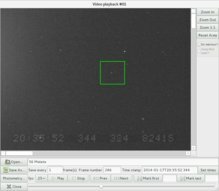 The autoguider has just been calibrated using the star within the green rectangle. The cross-hairs are rotated to match the orientation of the camera. You can zoom the display, set the background level and adjust brightness, contrast, gamma and gain for those cameras that support it. GoQat's video playback window, showing a recording of an asteroid occultation with overlay from a GPS time inserter. You can adjust the playback speed, or scroll to any desired frame. 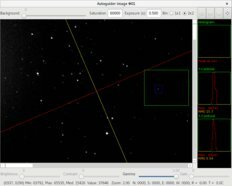 Selected parts of frames can be saved as FITS files for further analysis, and you can perform photometry and astrometry on the video recording automatically. Create and run lists of tasks using GoQat's in-built task editor. All log messages are automatically saved to the log file when the task list is running so you can see exactly what happened - ideal for unattended observations while you sleep! GoQat 2.1.4... a slight delay. See the news page for more details!